WHAT IS THE PURPOSE OF A SNUGGLIE? Bright colours and textures help your baby to develop their visual and tactile abilities. The ribbons sooth baby’s gums during teething, while at the same time, the blankie helps to keep the drool cleaned up. Dummy holder: On one of the corners there is attached an extra long ribbon that you put through the dummy ring. 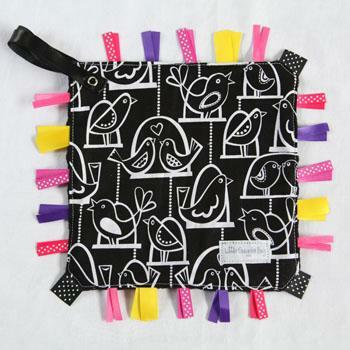 The ribbon has a snap on the end that when snapped onto the snugglie square secures the dummy in place. The snugglie also acts a security blanket and comforts baby. All the Ribbons have been TRIPLE stitched for worry-free play. Ribbons are NOT looped and have been heat sealed to prevent fraying. This item has been created with one layer of flannel and one layer of minky which means, clean ups will be taken care of quickly. With every wash this snugglie will become softer and fluffier. Please note that each snugglie is handmade and as a result, no two snugglies will be exactly the same or appear 100% as shown in the photo.